Stop in the name of love! 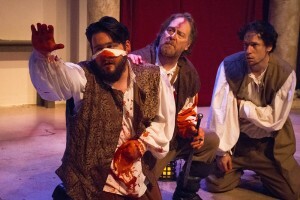 L-R: Noah Luce, John Clark, and Danny Herter in GreenStage’s Hard Bard production of John Webster’s The Duchess of Malfi. Photo by Ken Holmes. 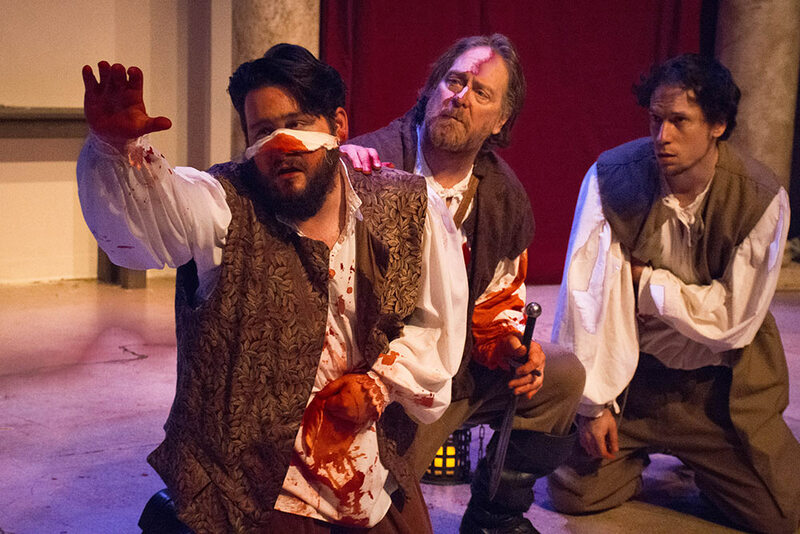 We just got some photos in from last night’s dress rehearsal of The Duchess of Malfi and it’s just as we hoped. No, as we FEARED: There’s lots of blood! This year’s Hard Bard play opens tonight and runs through March 19 at Stage One at North Seattle College. FREE tickets here. Tony Driscoll, the originator of Hard Bard, the Godfather of Gore (we’re testing new nicknames for him…) is directing this blood-fest with a cast that includes Hard Bard veterans, actors who have worked on our summer park shows, and a good infusion of new blood. Hard Bard is so over-the-top bloody the outrageous violence becomes hilarious. Past audiences have loved our red-and-slippery performances of Shakespeare plays and other classic titles. The Duchess of Malfi promises to be a bloody good evening of fun! Here’s a tip for newbies: wear white and sit in the first or second row. It’s a lot like Shakespeare. Spoiler alert: most everyone dies in the end. Go see a play! There will be blood!